ProSource® of Milwaukee South is locally known to offer a variety of bathroom remodel products, from bathroom sinks to toilets to showers. We provide high-quality brands from some of the top manufacturers in the nation, and our team can offer their professional designing advice for your next client’s bathroom remodel project. From beautiful stone slab to traditional white basins, we provide bathroom sinks that match every taste. 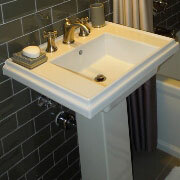 Talk to us about your overall design goals and we will guide you to the perfect sink. 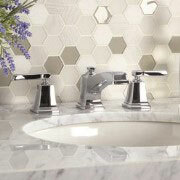 Controlling water flow and providing a design accent, the bathroom sink faucet plays a vital role in any remodel. Talk to us about the top faucet brands we carry and find the right design for your needs. From simple showers with one traditional head to stunning modern showers with an array of shower heads spraying from all sides, we can help find the right shower to pull your bathroom remodel together. 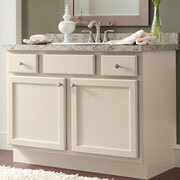 Storage space can be easily increased when you add a vanity to a bathroom remodel. From simple to ornate, we can find a vanity that works with your overall theme. 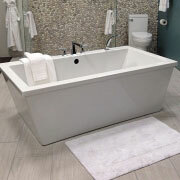 From relaxing bubble baths to a place to wash a furry pal, the tub is a vital component in a bathroom. 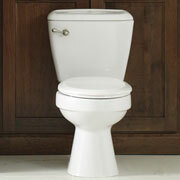 We have access to tubs of all sizes and styles to ensure you can find exactly what your bathroom needs. When a toilet requires jiggling the handle, or gallons of water are wasted with an outdated toilet, treat yourself to our vast selection of toilets. With different styles, colors, and designs, we can help find the right choice. We proudly serve clients throughout the Franklin, Wisconsin community. The ProSource of Milwaukee South (Franklin) showroom is conveniently located in Franklin, Wisconsin and serves all of the neighboring cities including Afton, Avalon, Bassett, Benet Lake, Big Bend, Bristol, Burlington, Caledonia, Camp Lake, Cudahy, Delavan, Eagle, East Troy, Elkhorn, Fontana, Footville, Franklin, Franksville, Genoa City, Greendale, Hales Corners, Hanover, Honey Creek, Janesville, Kansasville, Kenosha, Lake Geneva, Lyons, Milwaukee, Mukwonago, Muskego, New Berlin, New Munster, North Prairie, Oak Creek, Palmyra, Pell Lake, Pleasant Prairie, Powers Lake, Racine, Rochester, Saint Francis, Salem, Silver Lake, Somers, South Milwaukee, Springfield, Sturtevant, Trevor, Twin Lakes, Union Grove, Walworth, Waterford, Whitewater, Williams Bay, Wilmot, Woodworth and Zenda.